One-man committee headed by Sri Kamlesh Chandra, Retired Member, Postal Services Board was set up by the Government of India vide Ministry of Communications, Department of Posts' Resolution No. 17-13/2013-GDS dated 19.11.2015 for examining the conditions of service and emoluments and other facilities available to the Gramin Dak Sevaks(GDS). The committee had submitted its report to the Government on 24.11.2016. The Government has carefully considered the recommendations of the One-man Committee regarding revision of TRCA and allowances and is pleased to order the following. The entire GDSs posts shall be brought under two categories viz. Branch Postmasters (BPMs) and other than Branch Postmasters. GDSs other than BPMs and working in Branch Post offices shall be designated as Assistant Branch Postmaster (ABPMs) and GDSs working in departmental offices shall be designated as Dak Sevaks. There shall be two slabs of working hours Viz. Four (4) and Five (5) hours and two levels of TRCA slabs each for BPMs and other than BPMs, For this purpose, the working hours of GDSS with 3 hours, 3 1/2 hours and 3 hours 45 minutes shall be revised to 4 hours and those with 4 1/2 hours workload shall be revised as Five (5) hours, with effect from 1.7.2018. 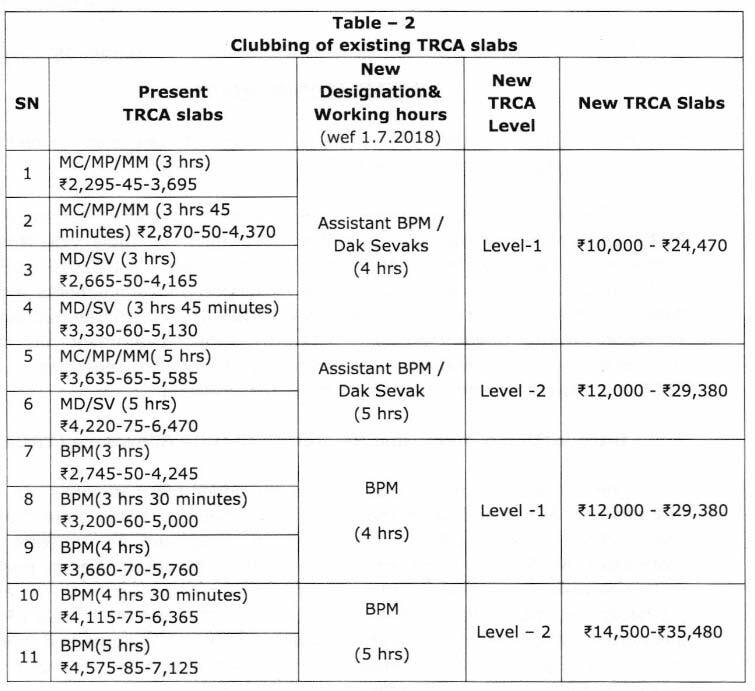 The existing 11 TRCA slabs shall be merged into three TRCA Slabs with two levels each for BPMS and other than BPMS as shown in Table 2. Effectively, there shall be only 3 TRCA Slabs as one TRCA Slab will be common for both the categories. The GDSs shall be brought to the respective levels in the new TRCA matrix wef 1.7.2018. 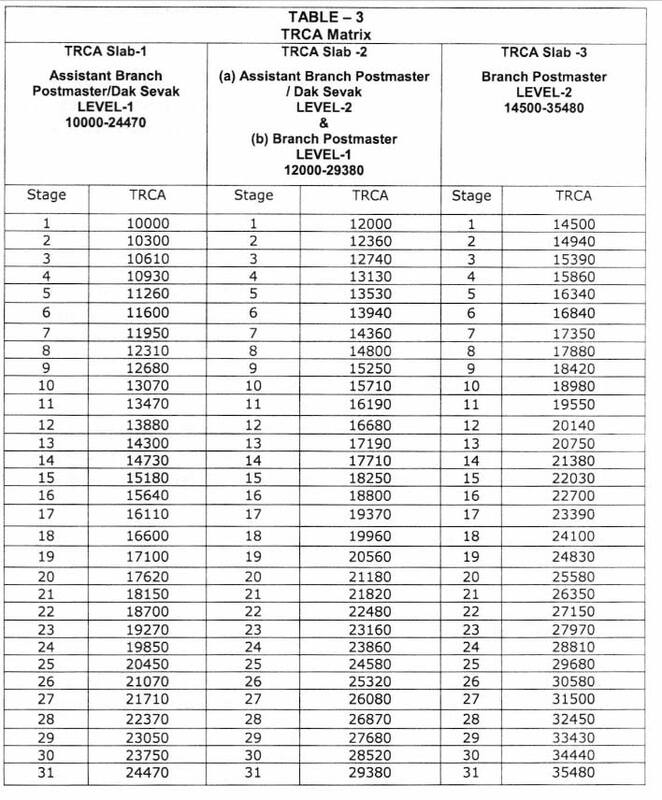 For fixation of TRCA of the Gramin Dak Sevaks in the new TRCAs labs, the existing Time Related Continuity Allowance (TRCA) for the GDS in the 11 TRCA slabs in the pre-revised structure as given in Table-2 above, as on 01.07.2018, shall be multiplied by a factor of 2.57. The amount may be rounded off to the nearest rupee. The figure so arrived at is to be located in the Level corresponding to GDS's TRCA in the new TRCA Slab as given in Table- 3. 2.3 If a cell identical with the figure so arrived at is available in the appropriate Level, that cell shall be the revised TRCA; otherwise the next higher cell in that Level shall be the revised TRCA of the GDS. However, in order to guide ad ministration/DDOs in fixing the revised TRCA of GDS in the new TRCA matrix correctly, illustrations in this regard are annexed at Annexure-II. 2.4 In respect of GDS whose annual increase of TRCA is due on 1st July, 2018,his/her TRCA consequent on annual increase in the pre-revised TRCA be effected first and then his/her TRCA be fixed in the new revised TRCA Matrix as in Table-3. 3.1. In respect of the GDSs engaged on or after 01.07.2018, the initial fixation will be done on first stage of Level 1 of the respective category. 3.2 There shall be two dates of annual increase in TRCA namely, 1st July and 1st January of every year; provided that a GDS shall be entitled to only one annual increase in TRCA on either one of these two dates depending on the date of engagement. Other allowances namely, Office Maintenance allowance, Fixed Stationery Charges, Cycle Maintenance Allowance, Combined Duty Allowance, Risk and Hardship Allowance have been revised as detailed in Annexure-I. The existing practice to grant the Dearness Allowance will continue, as per the Seventh CPC recommendations, as a separate component, and also as revised from time to time, whenever it is revised for Central Government Servants. Present calculation of Ex-gratia bonus by applying the calculation ceiling oft7,000 as basic TRCA + DA shall continue until further orders. The revised TRCA as per the matrix at Table-3 for all GDSs shall be applicable w.e.f. 01.07.2018. The revised rate of other allowances at Annexure-I shall also take effect from 01.07.2018. (iii) The difference between (i) and (ii) will be the amount payable to GDSs on account of arrears. 9. The payment due to GDSs, according to instructions at Para-8 above maybe initiated immediately so as to ensure disbursal latest by 15th July, 2018. Likewise, the process of fixation of TRCA in the new TRCA matrix as at para 2.2may be completed before 25th July 2018. With regard to the payment for the period from 1.1.2016 to 30.6.2018, an undertaking in the prescribed format (Annexure-IV) should be obtained from each Gramin Dak Sevak and kept onrecord before disbursement of the arrears.